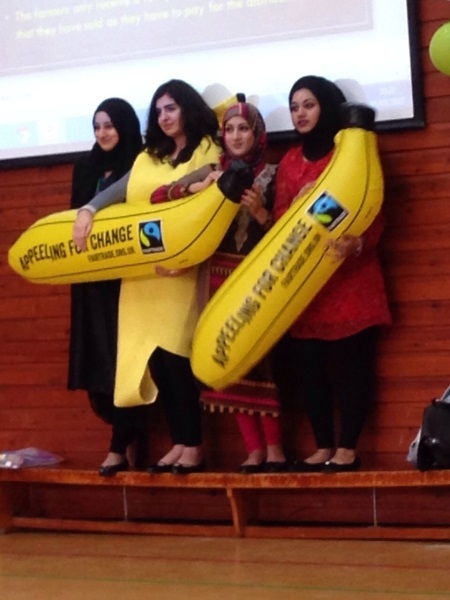 Carlton Bolling College went BANANAS over Fairtrade during the official ‘Fairtrade Fortnight’ (23rd Feb – 8th March 2015), and we are now officially a ‘Fair Aware school’! The year 13 Business Studies group worked extremely hard to promote Fairtrade throughout the school and to educate everyone about what Fairtrade means. A BUNCH of resources were sent out to tutors to encourage Fairtrade tutorials, and there was also THAT assembly to educate all year groups. 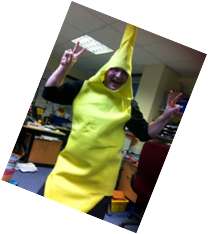 Who could forget the sight of a very embarrassed Solen running around in a very aPEEELing banana costume to promote Fairtrade? Students gave very positive feedback after the assemblies, and it seemed to be the talk of the school. In the canteen, the year 13 group produced a massive display providing information about Fairtrade, why you should buy it, how it helps and what to buy. It was accompanied by balloons and inflatable bananas and really brightened up the whole canteen. 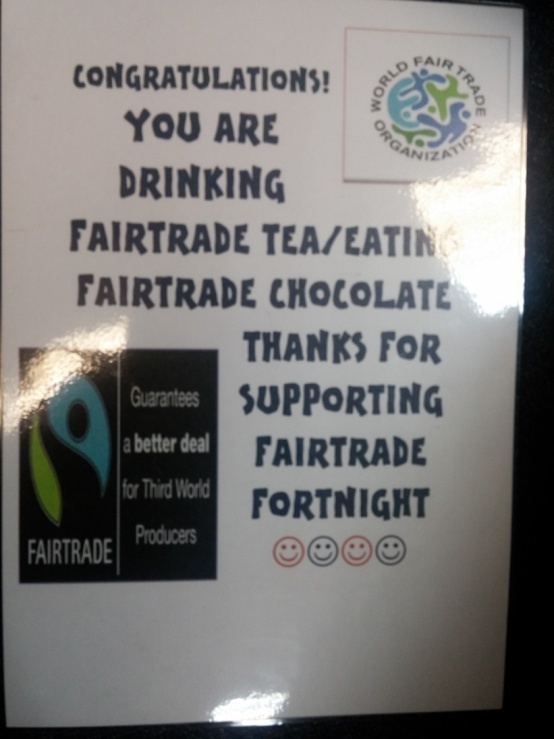 The business Studies group were able to put into practice their persuasion and liaising talents by writing letters to different organisations to sponsor the Fairtrade activities at the school. 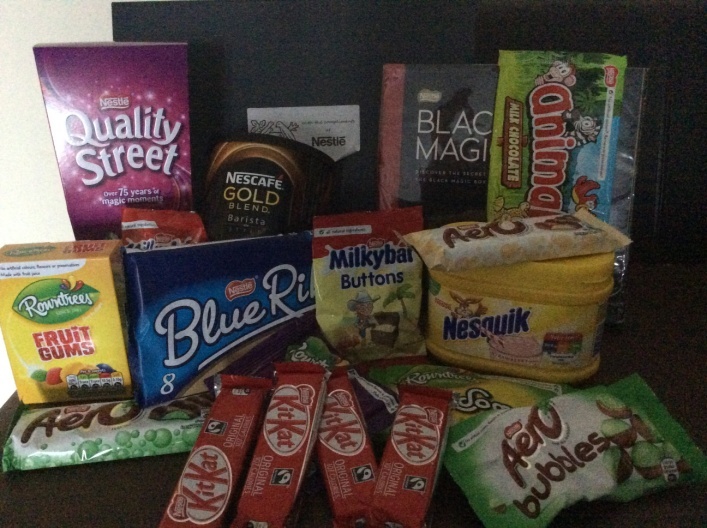 They were overjoyed when Nestle responded by donating a huge Fairtrade hamper filled with a variety of Nestle products. 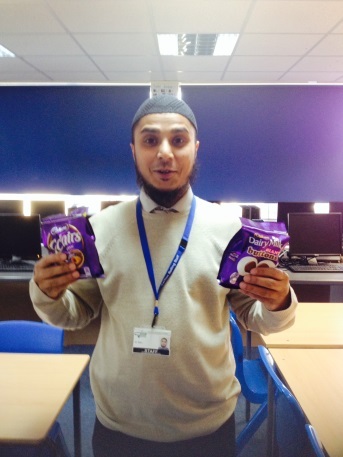 Tesco also responded and kindly donated a £10 gift voucher which the students used to buy more Fairtrade products. 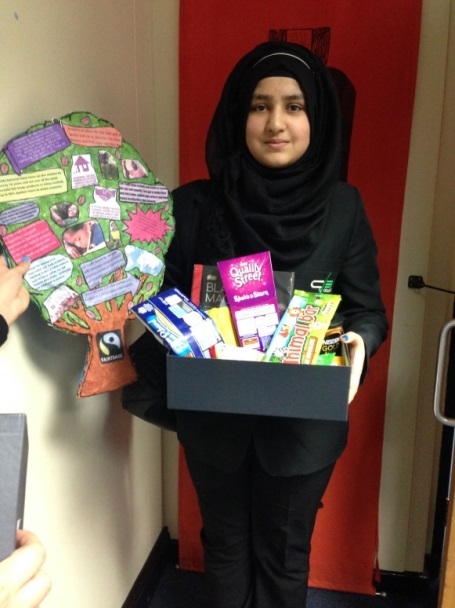 These were used as incentives to enter the Fairtrade poster competition – and it certainly did motivate! We were overwhelmed by the amount of entries, and the students spent a lot of time judging all the high quality posters. 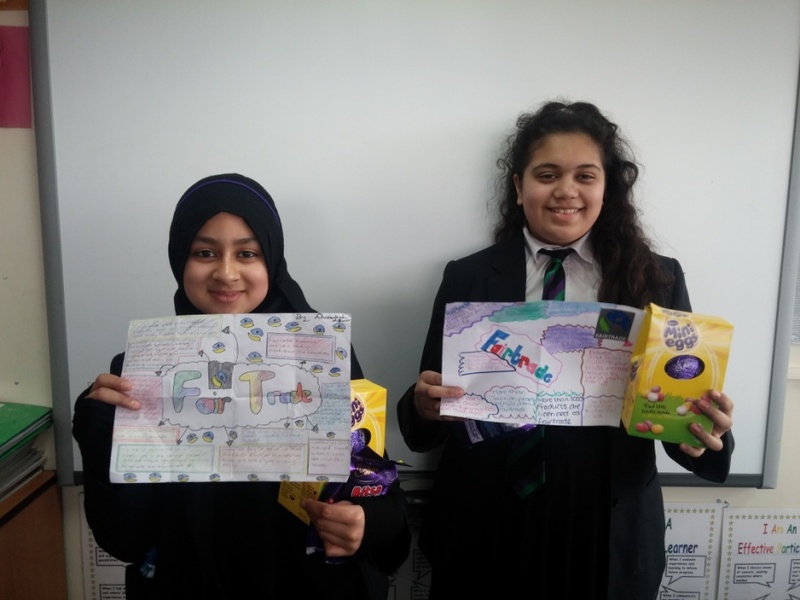 It was evident that students had learnt a lot about Fairtrade and some had spent a lot of time outside of school producing excellent work to meet the criteria of the competition. ICT and Media students were encouraged to enter the nationwide competition ‘PrintIT!’ which gave them an opportunity to compete with students from around the country and to win prizes as well as being invited to a prestigious awards ceremony. Fairtrade Fortnight was an overwhelming success, with both students and staff learning about Fairtrade and how the effects it has on a global scale. It was great to develop links with local businesses who were keen to donate the wonderful prizes and it was GREAT to see the amount of effort and creativity demonstrated in the competition entries. Well done to the year 13 business class for organising all the events during Fairtrade Fortnight I’m sure you’ll agree they did a splendid job! 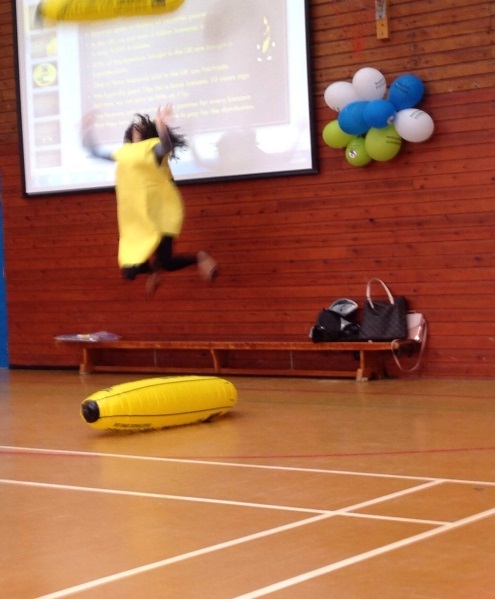 Thank you also to all the teachers who took the time to teach and encourage the creativity and independent learning required to enter the competition, thanks to everyone who entered, and thanks to everyone who brought joy by dancing around in that banana costume! Posted on April 16, 2015, in Uncategorized. Bookmark the permalink. 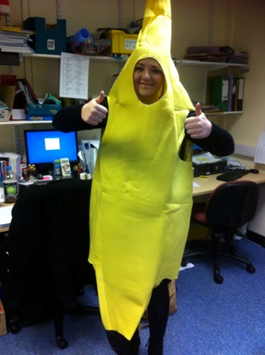 Comments Off on Going BANANAS for Fairtrade!.